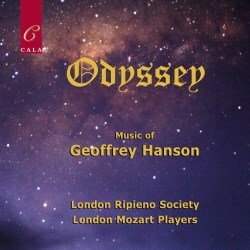 London-based, English-born composer Geoffrey Hanson is a leading figure in the London Ripieno Society. He founded the Society more than fifty years ago. In addition to championing Baroque works, he has included music by Tippett, Rawsthorne, Britten, Tučapský, Burgon and Berkeley in his concerts. This is his first orchestral disc, courtesy of Cala and his sponsor contributors - listed towards the end of the booklet. There are three works for choir, two succinct concertos and a song-cycle for tenor and orchestra. The music was written during a 35-year period from 1978. The words are set out in the excellent booklet which also includes a helpfully detailed Composer's Note. The Five Nocturnes is a marvel of frankly expressed clarity. Hanson uses the chamber orchestra in exemplary fashion - the melodic material is in a grand tradition and will appeal to those who enjoy the orchestra song-cycles by Carey Blyton and Geoffrey Bush. The declamatory style suggests Britten but there is a stronger expressive core and the wit has a more yielding blade: try the superb penultimate song, An Appeal to Cats in the Business of Love. Both the excellent tenor Pablo Strong and the orchestra bring out a battery of gawkily fine and eldritch detail: "Ye cats that … spit love at each other … I appeal to your scratches and your tattered fur …"
The 1988 Clarinet Concerto is in one movement. This music is not experimental - at least not in any thorny sense. Once again the writing is the epitome of clearly laid-out sound and ideas. It has a Rawsthorne-like after-taste and proceeds in a kaleidoscope of sec moods, bustling, uncertain, changeable, jackanapes-witty, purposeful and revelling in display. Orpheus, to words by Osbert Sitwell, is a vocal virtuoso piece with a probing piano line that again reminded me of Geoffrey Bush. The little Jubilate Deo is flecked with a surprising darkness - an apt reflection of the God-fearing theme that underpins Psalm 100. The second concerto here is from a quarter century after the clarinet work. Odyssey - also in one movement - is a more open and emotional, indeed romantic, work with a greater succulent density of sound. It is presented with soulful singing urgency by Sebastian Comberti and his partners. It has that colour-subdued yet irrepressibly singing quality that I also hear in the music of American composer Arnold Rosner. It is well worth programming Odyssey the next time you are thinking of choosing Bloch's Schelomo. Finally Now Welcom Somer is an a cappella work of five songs: Now Welcom Somer (Chaucer), Winter is Cold-Hearted (Christina Rossetti), Bed in Summer (R L Stevenson), Beside the Idle Summer Sea (W E Henley) and On the Idle Hill of Summer (A E Housman). Typically inventive and pleasing to the ear, the language is not that far removed from the RVW's Three Shakespeare Songs. Helena Thomson steps forward from the choir for a magical solo in Bed in Summer. Then two poised references to the idleness of summer. Beside the Idle Summer Sea (W E Henley) is strangely static and desolate - very affecting and seeming to speak of irretrievable loss. Finally in On the Idle Hill of Summer (A E Housman) Hanson takes another path from most of the settings of this poem; not for him a swinging march with elements of fatalism but instead a sustained shiver and chill. It takes a brave and sterling composer to end on such a note. Hanson does not disappoint. You can find a list of Hanson's works here. Now I want to hear the concertos for piano, for oboe and for violin not to mention the large-scale Sinfonia Amoris. A wide-ranging cross-section of the music by Geoffrey Hanson: varied, cool, emotionally engaged and concentrated.